Speeding the development of new therapies and diagnostics for glaucoma patients. Glaucoma 360 New Horizons Forum unites key clinical, industry, financial, and regulatory leaders in a unique exchange on research innovation and advances in glaucoma treatment. "Glaucoma 360 is the single best meeting for all that care to improve the lives of those with glaucoma." "Glaucoma 360 is the go-to meeting for a comprehensive overview on what's new in glaucoma." 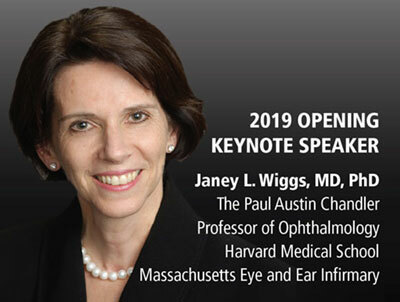 "This meeting is a great place to see new science, new pharmaceuticals, and for interaction between researchers, industry, and the FDA…with the single focus on glaucoma." All requests for refunds, cancellations, or substitutions must be sent to Michelle de Elizalde at michelle@glaucoma.org. Please note that a 20% administration fee will be issued for refund requests received via email before January 18, 2019. No refunds will be granted after that date. Refunds , Cancellations, and Substitutions for New Horizons Ticket Purchases: All requests for refunds, cancellations, or substitutions must be sent to Michelle de Elizalde at michelle@glaucoma.org. Please note that a 20% administration fee will be issued for refund requests received via email before January 18, 2019. No refunds will be granted after that date; however, substitutions are welcome at any time. Payment Information: For attendees paying by check, payments are due by January 25, 2019. If you should cancel after January 18, 2019 or are a no-show, full payment is still required. Disclaimers: By completing registration and attending this event, you are giving your permission to be photographed, filmed, and published/promoted as an attendee of such event. Questions or concerns: Any inquiries regarding this list of terms and conditions can be emailed to Michelle de Elizalde at michelle@glaucoma.org.